Discovery STS-133 astronaut Steve Bowen stands at the tip of the International Space Station's Canadian robotic arm, with the Earth and space shuttle in the background, during the second spacewalk of his mission on March 2, 2011. HOUSTON – Astronauts on the International Space Station and shuttle Discovery will tackle a busy day of unpacking in orbit today (March 4), after enjoying a short break from work yesterday. Discovery's six-astronaut crew attached a new storage module, called the Permanent Multipurpose Module (PMM), to the space station earlier this week. The large space closet was attached to the bottom of the U.S. Harmony node to give the station's residents extra storage space for hardware, spare parts and science experiments. But while the station's new storage room completes NASA's contribution to the assembly of the space station, there's more work ahead. The module is packed full of critical supplies, including about 6,500 pounds (over 2,900 kilograms) of cargo for six astronauts and cosmonauts living on the orbiting outpost. The storage module also contained a humanoid robot, called Robonaut 2, which is designed to serve as an astronaut assistant in space. The robot will be tested by space station crews eventually, but for now is being kept in its foam case for safekeeping, the astronauts have said. 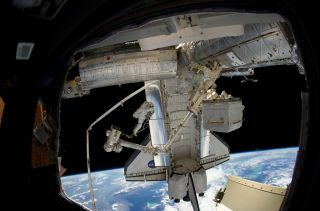 The astronauts have spent several days moving cargo into the station from the new storage room and Discovery's middeck. That work will continue today, and will take up majority of the day's tasks, mission managers said. Flight controllers here at NASA's Johnson Space Center also decided yesterday to extend Discovery's STS-133 mission – giving the orbiter a total of 13 days on orbit for its final flight before retirement. Following this mission, Discovery will be retired from service after 39 trips into space, including 13 visits to the International Space Station. NASA has two more shuttle missions planned – Endeavour in April and Atlantis in June – before bringing its 30-year space shuttle program to an end. With the mission extension, Discovery is now scheduled to undock from the space station on Monday (March 7) and land on Wednesday (March 9) at the Kennedy Space Center in Florida.